More than 70 percent of cell towers were out in the hardest-hit counties as of Thursday morning. 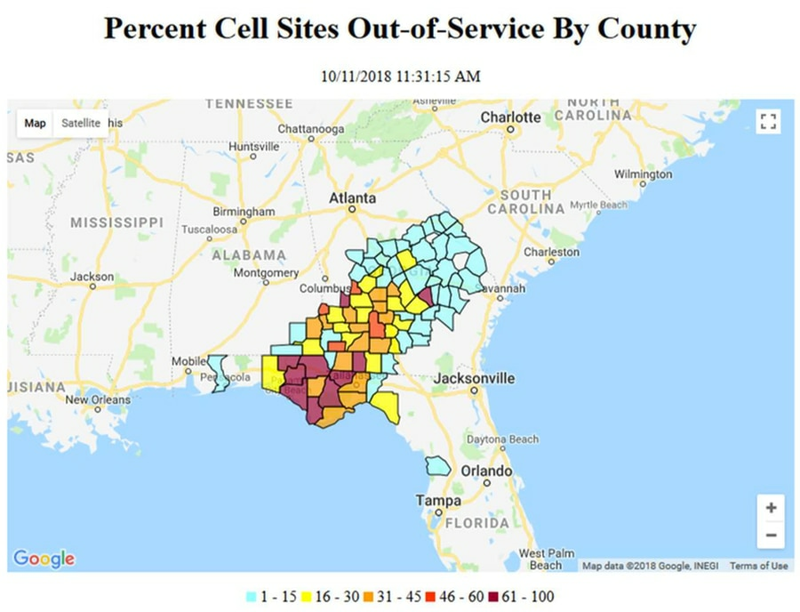 A map from the FCC showing widespread cell tower outages along Hurricane Michael's path. Widespread cell tower and internet outages have been reported along the devastating path of Hurricane Michael, according to the Federal Communications Commission's first report following Wednesday's storm. More than 70 percent of cell towers were down in the hardest-hit counties where the storm made landfall, and more than 185,000 cable customers in Florida were without service. The effects were felt heavily in Tallahassee, as well, where more than 40 percent of cell towers were down as of 11:30 a.m. Thursday. The FCC routinely tracks outages among cellular and cable providers following major storms and disasters. The level of outages following Michael are similar to when Hurricane Irma struck Florida last year. Outages don't necessarily mean the cell towers are damaged or destroyed. Power outages are a more likely cause of outages, experts say, and Hurricane Michael has left 400,000 people in the dark. FCC Chairman Ajit Pai said in a statement that he was working with providers to restore service and was happy with their responses so far. "We were pleased that carriers had pre-positioned equipment and were in the process deploying cells on wheels (COWs) and cells on light trucks (COLTs) in order to get wireless service up and running in many locations," Pai said in a statement. The FCC will be updating its outage map daily. The reports are viewable here. "Our 49 angels deserve to be memorialized "